Developing a Joomla Ecommerce website is sometimes complicated and time-consuming if you do not have the best tool at your fingertip. We found that many people do not give much time finding the template which will solve his purpose. So, unfortunately, end up with the worst design that does not have vision. That’s why we have done the research part for you and found some of the best ecommerce Joomla templates of all time. These ecommerce Joomla templates not only help you to launch your Online Shopping site in minutes but also give your site an edge to your rivals. Thinking of traditional coding and designing would be required to develop the site? Forget all these. Even a newbie with basic computer knowledge can build an awesome web store. Yes, you are reading it right! 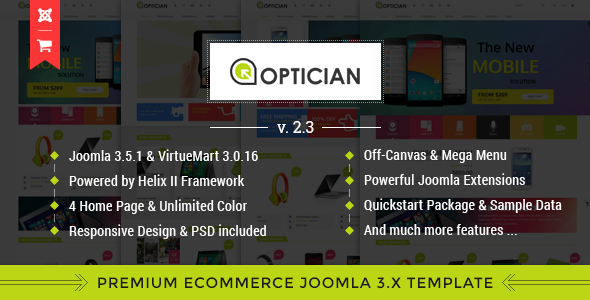 These templates are integrated with Virtuemart, J2Store and HikkaShop e-commerce extensions. Both of these are pioneered in their respective arena that further ensure of making the best out of best. If you develop your next online shopping portal with these ecommerce Joomla Templates, I’m sure people will find browsing throughout the site adventurous while repeating over and over again (with purchases for sure). After digging out the web, JD Shop bound us to place it at the top. It is a fully responsive and retina ready Joomla template. Its features are way beyond your imagination. Hey, I’m not giving a marketing speech here. Once you start working with this powerful template, you will also say the same. It comes with Helix 3 Framework and inbuilt blogging system so you can present your content to your website visitor with the help of K2 or EasyBlog. JD Consult from Joomdev may not be the best but it is surely one of the good multi-purpose ecommerce Joomla Templates. This is fully responsive and compatible with most of the popular browsers. It comes with powerful extensions such as SP Page builder Pro to create unique pages just by drag and drop the elements. In addition, they have included Smart Slider 3 Pro for the best sliding experience. Its lightweight feature loads a page in seconds while best SEO practices help to appear your website in search engine’s result. Don’t spell it wrong, it is not Fantastic but Flatastic. It is another fully functional VirtueMart Joomla Template. You will be amazed when you see the online web store live. Why? Designers of this breathe taking template has excellently composed very corner of it leaving you to showcase creativity. Visitors will be able to access products that are displayed beautifully from any of your preferred category layouts. And a quick product view also ensures fewer clicks while picking the desired item faster. Mega Deal II is a premium and most elegant Joomla E-commerce template introduced by Joomshaper. It is perfectly designed to sale tech products but can also be converted to another ecommerce site easily. It’s nice flat design packed with the most robust Helix3 framework offering endless features with lots of customization options. SP Page builder, on the other hand, enables you to create unique pages while Google font helps you generate nice fonts that match your business. Shopin is a minimalist & flexible Joomla 3.8+ Template designed to develop any kind of ecommerce Joomla site. It comes with a powerful Helix framework and super cool homepage layouts give a unique touch to your website. Shopin provides a complete solution for those who are going to sell products online (the Online Business site like books, clothing, hand-made decor, and so on). The template is running with powerful J2Store extension. Pajuh is a nice, fresh, smooth and clean & sleek Joomla VirtueMart template that comes with a bundle of features for building stunning an online shop in any niche. Pajuh follows all the modern SEO best practices a web store must have to not only for ranking in search engines but also offer its visitor an awesome user experience If you in need of a crispy hot Joomla template, Pajuh is the only one for you. If you are running a boutique, fashion, and electric shop or have a plan to establish one in the near future, then Shopx, Joomla Template by Themexpert would be best suited for you. It is fully responsive, which means that it can fit any screen size whether it is mobile or desktop. However, a clean and minimal design ensures that visitors get a unique and pleasant browsing experience Layouts of a homepage, you just need to personalize with information, image and other content. Welldone is another powerful Joomla template having endless possibilities. The vendor of this stunning template really ‘welldone’ every section. However, you can create any type of online stores but an online fashion house would best suit it. Firstly, Welldone comes with 10 different layouts. You have the freedom to switch things up in many ways. Furthermore, you can select any one header and footer option out of four or even mix up to your needs. 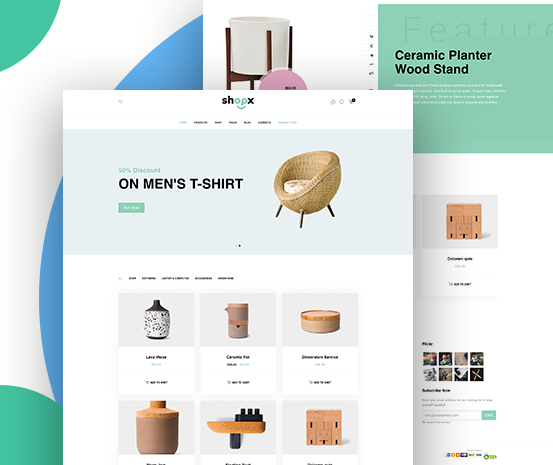 The JA Megastore is a clean and sleek, powerful, multi-purpose, VirtueMart integrated Joomla Template for your new business website. As the name implies, you can expect that the template would perfectly suitable for any Shop website with dedicated features, layouts, and style. JSN Ferado 2 a feature reached premium Joomla ecommerce template comes with robust JSN SunFramework. This template is mostly used by professionals to design a fully fledged online store by combining its powerful elements. It is a fully responsive Joomla shop template having two homepages for Virtuemart and redShop. You can upload as many products as you want because it comes with nice and flexible Mega Menu for a content reached a website. MaxShop is a super responsive and cool VirtueMart Joomla Template designed to for digital store, hitech store, watch store, fashion store, accessories or retail websites. This stunning template will bring life whatever products you want to sell with an awesome shopping and browsing user experience. It comes with various layouts for the product details and front page, grid and list view, a unique category page and different headers options. In addition, the cart is crafted to drive sales while the blog section aimed to give perfection for content marketing. Are you on the verge of a transformation of your existing online store, then consider Sj Market II, a premium Joomla Template with integrated VirtueMart 3 component. On the other hand, if have just joined in the world of e-commerce, Sj Market II would be best suited for you. It will guide you developing a super cool web store starting right from the bottom. 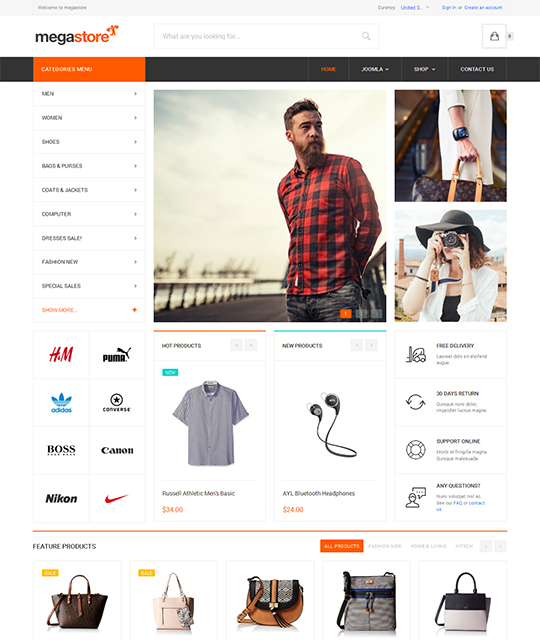 Meet the revolution of ecommerce templates- Trendy Store by Joomla Monster. It is a multipurpose premium ecommerce Joomla template comes with J2 Store, an e-commerce extension said to be one of the best of this kind. This super flexible template works seamlessly with any viewing device whether it is a tablet or PC. Its eye-catching designed attract its visitors to browse through the products in different ways which is very important to increase sales. Looking for a Joomla ecommerce template for your next online store? Your search ends here. Vina Optician by VinaWebSolutions brings their long-awaited super flexible responsive ecommerce template developed using Helix 2 Framework. This theme comes with a unique design while having a dedicated side panel. Its prominent styling is perfect to act as a focal point. It has all new 3 shopping solutions; in addition to its refined structure, style and visuals. Kick start your online apparel store with an amazingly clean and eye-soothing Joomla template introduced by .themeparrot named Outfit. 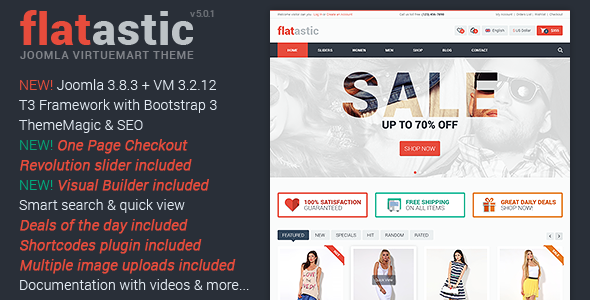 It is a premium Joomla 3.8, J2Store template powered by T3 frameworks. With well-planned layout, categories, mega menu, online store features and helpful tags system will surely help your customers to locate exactly what they are looking for. The above-mentioned premium ecommerce Joomla templates have been chosen by many people across the globe. Most of these Ecommerce Joomla templates are competitors of one another; however, these are designed to meet a specific niche. We hope you have found the article very helpful choosing your next Responsive Joomla Ecommerce template. If you have anything to know, don’t be reluctant to drop a comment.